When it comes to dental hygiene, our assessment is that the Aldi Regular Buy selection is a little on the bare side. Among toothbrushes, the Aldi stores around us pretty much only stock one basic toothbrush, the Dentiguard Pro Plus. Anything beyond that, such as electric toothbrushes or sonic toothbrushes, are Special Buys, so they’re only available a few times a year. The same goes for this one. Using the toothbrush is simple. You pop in the battery, press the button, and brush, to the tune of 22,000 sonic brush strokes per minute. Replacing the heads is as simple as twisting and removing, then replacing. The packaging states that brush heads should be replaced every three months or when the bristles are worn, but because this is a travel toothbrush you probably won’t use it as often, meaning you’ll likely get a lot more than 9 months out of it. I’ve spent a good amount of time with the Dentiguard Rechargeable Sonic Toothbrush so it’s hard not for me to compare it to this one. Unfortunately, that means that there are features on the Rechargeable that aren’t present on this travel toothbrush. The Rechargeable, for example, is timed to run for two minutes, with a pause every thirty seconds to move to another part of the mouth; this travel toothbrush does not, meaning that you have to either keep a timer on-hand or guestimate the time. The Rechargeable also has multiple settings; the Travel has one. Another important note: the heads of the Rechargeable and Travel toothbrushes are not interchangeable, so what works on one does not fit on the other. The Travel bristles are different, too, and the jury is still out with me on whether the Travel bristles are as good. 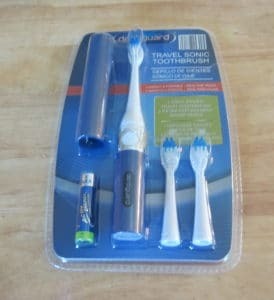 If you’re looking for a travel sonic toothbrush, the Dentiguard Travel Sonic Toothbrush is a cheap and functional option. I wish it had a timer like it’s bigger cousin, but it does the job for when you need something portable. The 1-year warranty is a nice bonus. My toothbrush handle just broke. I still have one replacement head in the box. It says Model 902016 Product Code 49846. My package doesn’t look like this one, but the head looks the same.